There are a few go-to dinners I have kept in my repertoire through the years … not the ones I could make in my sleep because I cook them so frequently, but the ones that pop back up when I am in the mood for something a bit different. These dishes are from a couple of recipes I found (and tweaked, of course!) many years ago, and they just seem to go well together. As a plus, the preparation is fairly simple, straightforward and quick. As another bonus, it plates well. Fresh asparagus stalks –Since asparagus does not really change form when you cook it, you can visually gauge approximately how much you will want to prepare. For quality control, I buy asparagus when I can find the smaller, thinner stalks. I do not cut the bottoms off, I snap them – I find that if a stalk will not snap, it will be chewy when it cooks (not in a good way like brownie chewy or caramel chewy). Combine ingredients to make dressing. Cover the bowl and refrigerate until ready to serve. Heat olive oil in a large skillet on high. 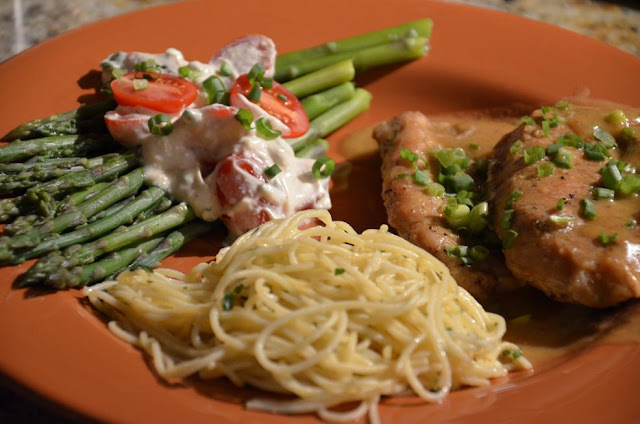 Season pork steaks evenly with the seasoning blend on both sides. I would normally add salt to the blend, but broth is typically salty enough. Place steaks in heated skillet, and sear until a golden brown crust begins to form on the bottom side. Flip, and sear for another 1-2 minutes. Add the broth to the skillet, and heat to boiling. Move the steaks around to help dislodge the yummy pork bits from the bottom of the skillet. Reduce heat to simmer, and cover. Simmer for 30 minutes. Meanwhile, prepare the asparagus. Snap the bottoms of the stalks off, and rinse the spears well. Place in a shallow saucepan, and just cover with water. Heat to a medium boil, and sprinkle with a pinch of salt. Simmer for only a couple of minutes; test a stalk by either snapping the end or cutting through it with a fork. Once it is tender with a bit of resistance in the center, it is done. 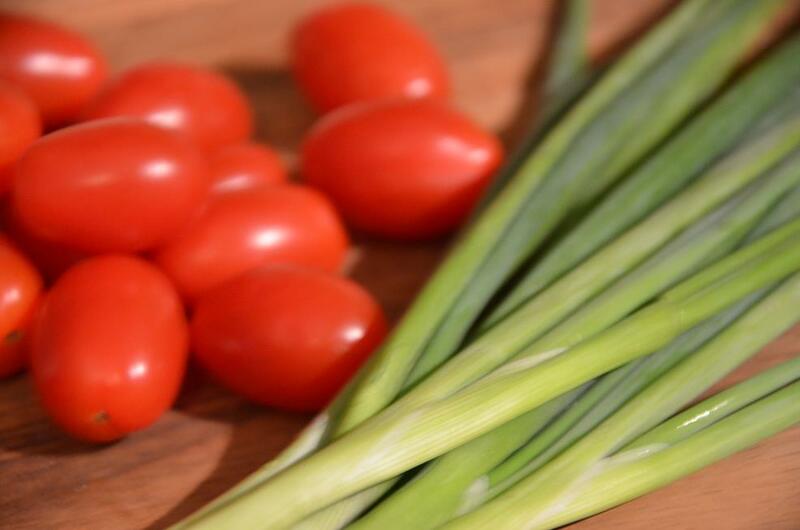 Pull the pan from the heat, drain the water, and quickly rinse with cold water – this will stop the cooking process. Set aside. Back to the chops! At 30 minutes, your pork steaks should be tender. Mix the corn starch with a tbsp. of water. Remove the steaks from the skillet and set aside. Add the spicy brown mustard to the skillet. Mix/whisk the corn starch in. The sauce should start to thicken quickly. If for some reason it is too thick, add water a tbsp. at a time. 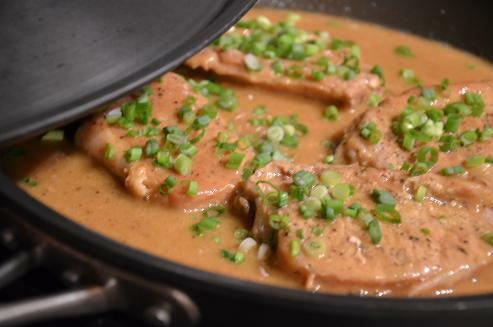 Once blended, return the pork steaks to the skillet, dredge in the sauce, and sprinkle the green onions on top. Cover and simmer on low for another 10 minutes. Place your pan of asparagus back on the stove on low heat to reheat before serving. 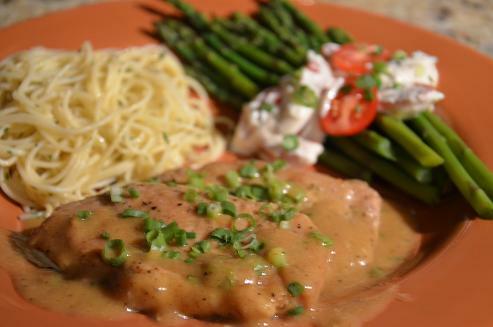 Serve your pork steaks on a bed of sauce, and your asparagus with the dressing spooned across the center.